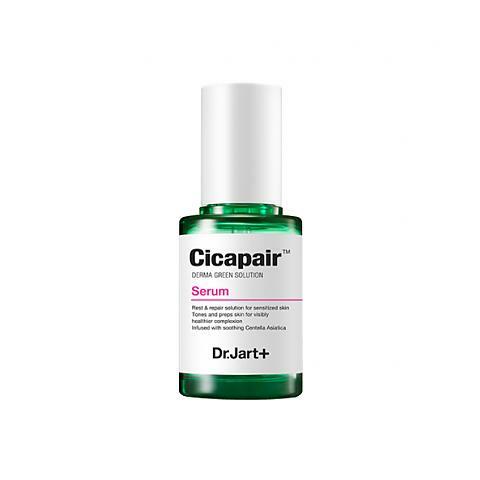 DR JART+ Cicapair Serum uses its Centella Asiatica Complex formula to provide instant relief to sensitive, red, irritated skin and result in a healthier complexion. Suited for all skin types. Highly recommended for sensitive, red skin. A highly concentrated serum that uses Centella Asiatica to quickly calm inflammations, redness and irritations as well as create a protection barrier over your skin. The Centella Asiatica Complex also contains mineral and herb complexes that moisturise, revitalise and improve your skin texture. This serum is an Allure Best of Beauty award winner. The Dr Jart+ Cicapair Skincare Line is inspired by the true legend of Asian Tigers, rolling in Centella Asiatica to heal their battle wounds. Active ingredient, Centella Asiatica (Cica), is also known as Tiger Grass. For centuries it has been used for medicinal purposes and is widely recognised for its anti-inflammatory and healing properties. See our entire DR JART+ skincare range here. After cleansing and toning, apply an appropriate amount of serum onto your face. Follow with the Dr Jart+ Cicapair Re-Cover cream, or your usual moisturiser.